Patterns of paper lace, festive birds and flowers, and intricately layered designs first attract a viewer to the historic Valentines in the Archives’ collection. A closer look reveals that some bear a maker’s identifying stamp. The earliest Valentines exchanged in America were made by hand or imported from Europe. 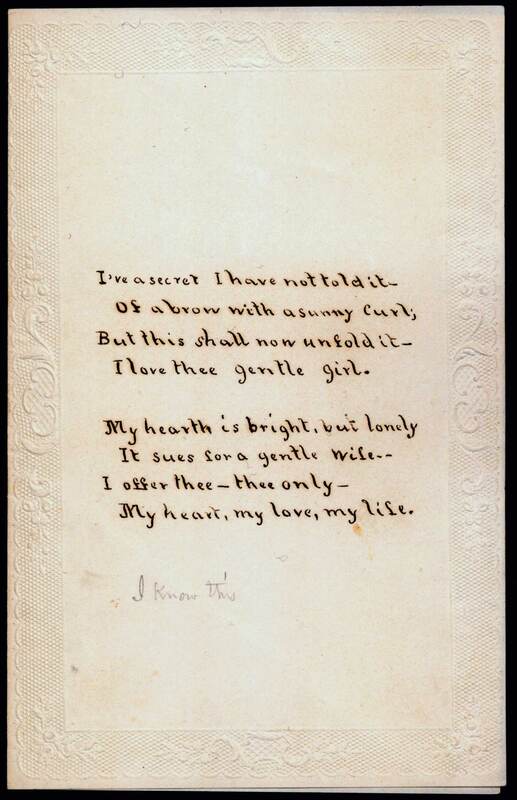 The A. J. Fisher Company in New York introduced domestically printed Valentines in 1835. 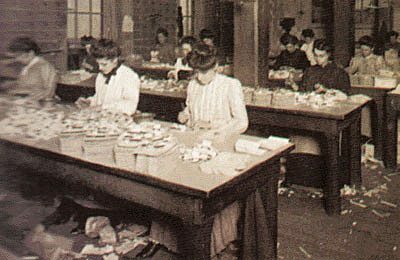 But it was the ingenuity of a young woman in Worcester that turned the production of Valentines into a profitable assembly-line project in New England. 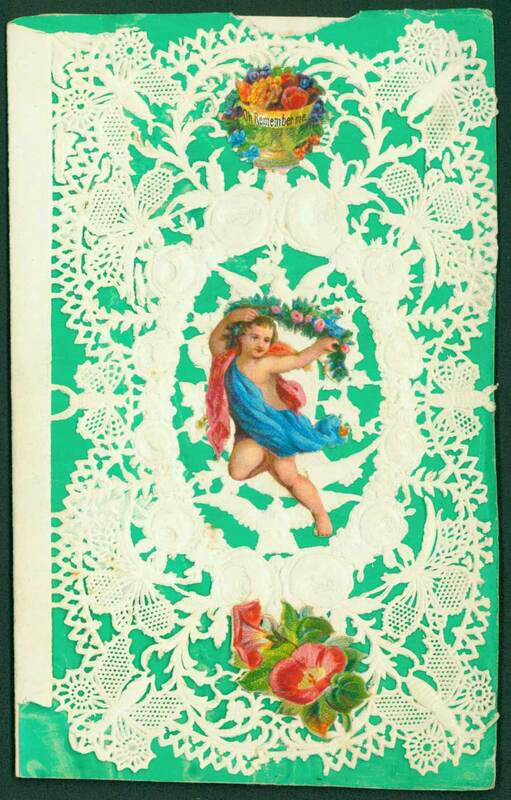 The decorative European Valentines sold in her father’s stationery store prompted Esther Howland (1828-1904), after graduating from Mt. Holyoke College in 1847, to experiment with her own designs. The cards she created at home from imported paper lace and floral cut-outs quickly attracted buyers. Friends helped Howland fill the unexpected orders. Soon she positioned women at long tables to cut, punch, paste, and assemble finished Valentines. Her first advertisement appeared in The Worcester Daily Spy in 1850. Earlier hand-crafted Valentines carried poetic messages in careful script and sometimes conveyed personal declarations of affection. Those sentiments became standardized when the market for Valentines grew. Howland’s early cards include four lines of conventional verse pasted inside. Her success brought competition. To distinguish her Valentines, she stamped on the back the identifying letter “H” in red ink. When George C. Whitney (1842–1915), initially her employee, expanded his own family business in Worcester after serving in the Civil War, he stamped his similar designs with a red letter “W.” Later he purchased both the A. J. Fisher Company and Howland’s flourishing New England Valentine Company to become the country’s largest producer of greeting cards. 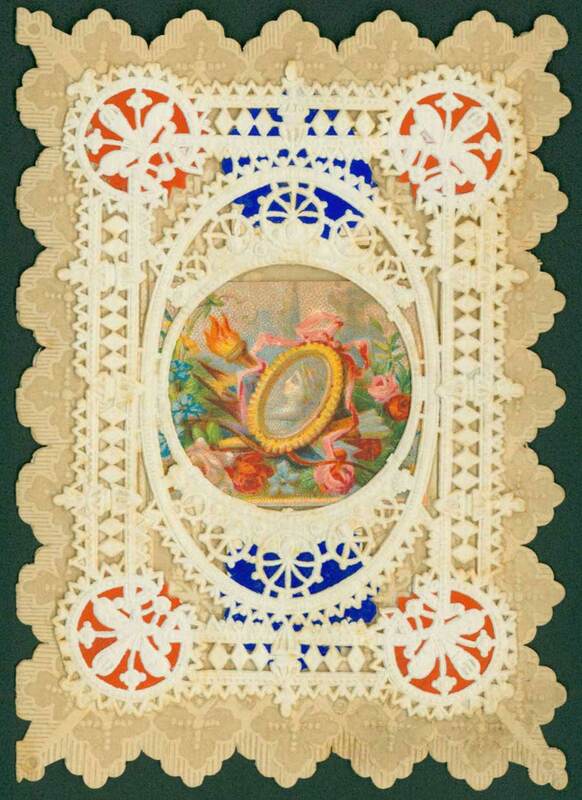 The 19th-century Valentines made in Worcester range from small, straight-edged, inexpensive cards decorated with flowers and a single layer of lace to more elaborate and costly constructions. Large formats, serrated edges, floral border designs, windows, silvery lace, and velvet ribbons embellish Whitney’s late-Victorian creations. 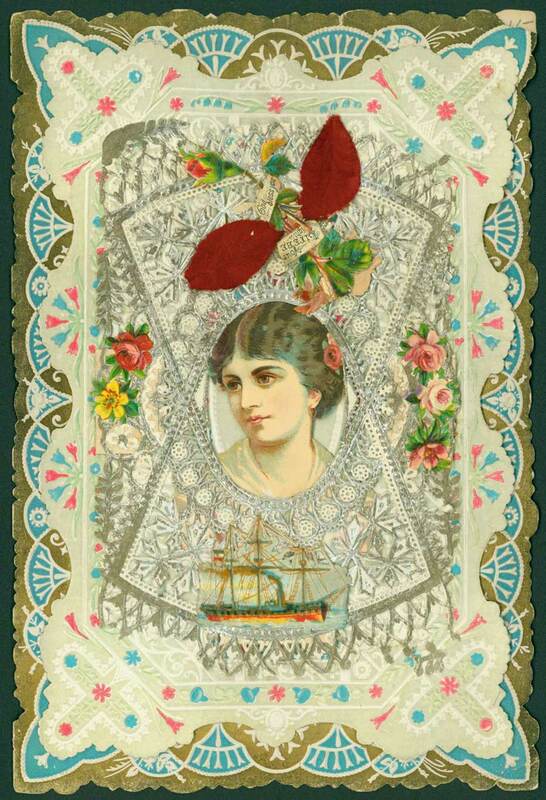 By then decorative cut-outs had become bolder and more topical, and an embossed steamship appears amid the conventional flowers surrounding a comely woman’s face.